Today we’re going to take a look at Here Today, Gone Tomorrow – another scare-mongering report from the annuities industry. 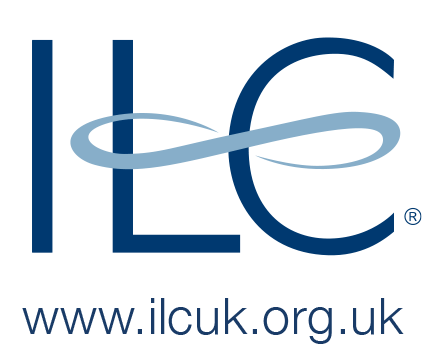 The report is published by the International Longevity Centre (ILC), which describes itself as “the leading think tank on longevity and demographic change.” The ILC claims to be non-partisan, but its website is sponsored by Legal and General and today’s report was funded by Aviva. We’ve met the ILC before, when we looked at their report calling for a Pensions Commission. That report was funded by Prudential. At the time we gave the ILC the benefit of the doubt, but there’s a clear pattern emerging: the ILC is funded by the insurance / annuities industry, who stand to lose out financially as people move away from annuities and towards drawdown under the new pension freedoms. Our conclusion was that the last report amounted only to deck chairs on the Titanic. The real problem with pensions is that we don’t save enough and we don’t understand the consequences. So we were not optimistic as we turned to the new 36-page report. The authors used the English Longitudinal Study of Ageing (ELSA) to examine the “consequences” – essentially the risk of income shortfall – of various decisions in retirement across a set of “consumer segments”. The 55% tax charge on cash withdrawals over the 25% tax-free tranche has been replaced with taxation at the retiree’s marginal rate of income tax. The 25% tax free sum can be withdrawn all at once, or gradually as part of each withdrawal. The compulsion to annuitise has been abandoned, though it was already possible to defer this to age 75 via flexible drawdown. As might be expected the ILC are fond of annuities, a big profit maker for the industry that funds them. They correctly point out that on average they provide the highest risk-free return. Advising someone with a life expectancy of 30 years to stick their money into the best risk-free asset is like telling a 25-year-old that they can save for retirement using Cash ISAs. They will end up a lot poorer than their friend who bought stocks. Prior to the reforms, 75% of UK retirees with DC pension pots annuitised. In contrast only 2% in the US and 2-10% in Australia – two countries where annuitisation is voluntary – do this. Although people say that a secure guaranteed income is the most important thing in retirement, in practice people prefer a liquid pension pot. They also don’t like the thought of dying young and not getting back the money they have spent. This feeling is exacerbated by the tendency of retirees to underestimate their life expectancy by between 4 and 6 years. There are further problems arising from increasing longevity and declining interest rates. Annuities offer much worse value than they did 20 years ago. Using ELSA data from 2010, there are 6 million people in the UK aged between 55 and 74, and not yet retired. Of these, 2 million have a DC pension pot, with an average (mean) size of £103K. The median is only £37K however, and the bottom quartile have less than £12K. 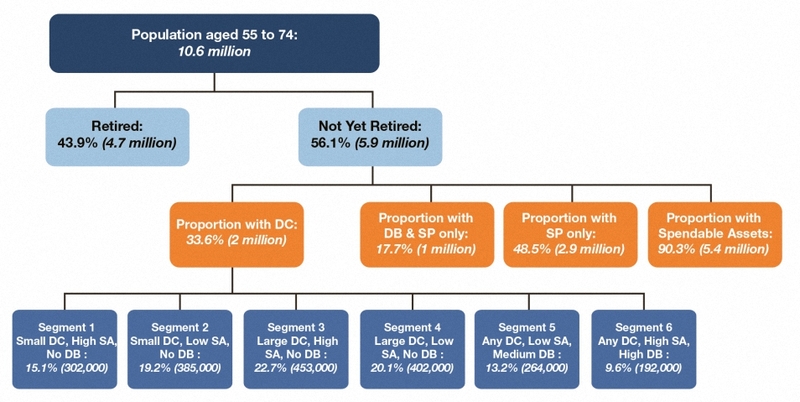 The ILC divide future retirees into five segments, as shown in the table above. Wealth by segment is given in the table below. The savings account approach works reasonably well until the money runs out. Average replacement rates then fall from 66% to 49%. 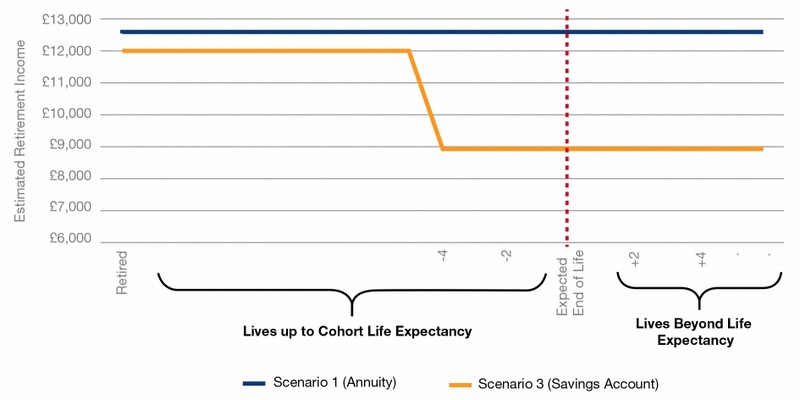 Before the savings money runs out, the proportion with adequate income is the same as under annuitisation (around half); this falls to 30% for the final four years. The group with the largest DC pots is of course the most badly affected (they have nothing else to fall back on); their replacement rates fall from 60% before to 40% after. Blow it all provides an average replacement rate of 49%, with 71% missing their target. Not good enough. Annuities fare reasonably well, with an average replacement rate of 70%, but still with 54% of retirees missing their targets. 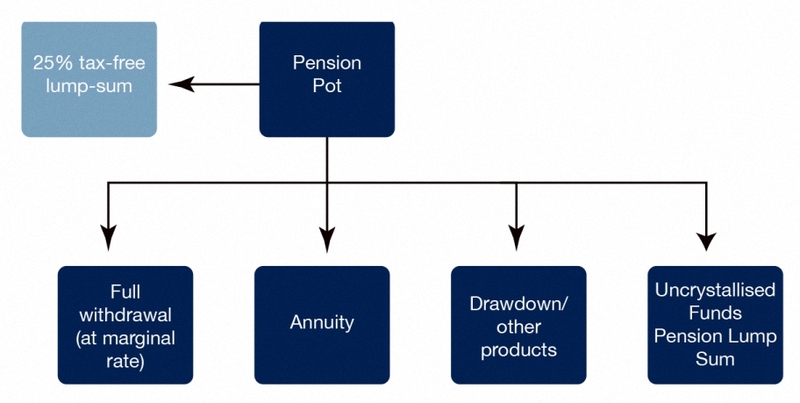 Drawdown, like the savings account scenario, is presented as a before and after situation. Before the money runs out, drawdown provides the highest replacement rate, at 74%. After the money runs out, this falls to 49%. Average income drops from £18K to £12K. We would argue that this asset mix is ludicrously conservative for investors with a 25 to 30 year time horizon, and also insufficiently diversified. A multi-asset, international portfolio with a much higher weighting to risk assets would be far more suitable, and would produce higher returns. We would also argue that the key to drawdown is taking a sustainable (replaceable) income each year, so that the pot is not depleted. This does of course require the pot to be much bigger in the first place. This report is just more smoke from the annuities industry. It attempts to put mathematical modelling around a few self-evident points about pension pots, and the impossibility of spending money twice. But the slant behind the models reveals the true objective – to pretend that annuities are still a good idea for most people. They aren’t. A properly managed drawdown solution will provide a higher income, and also last indefinitely. Regulators and the industry should work towards the creation of a low-cost, multi-asset, internationally diversified retirement product. A properly constructed element of death pooling would additionally boost returns. But the real problem is that people don’t save enough, and their DC pots aren’t large enough to be managed properly. We need to educate people about what retirement income they should be targeting and to help them to save the money they will need to generate that income. Free guidance needs to start in school, not at age 50. So we need to get people who currently save £37K by the age of 55 to save £286K instead. This is a much bigger problem than the risk that a few people will blow their pension pot, or the potential loss of profits for the annuity industry. There’s a mountain to climb. 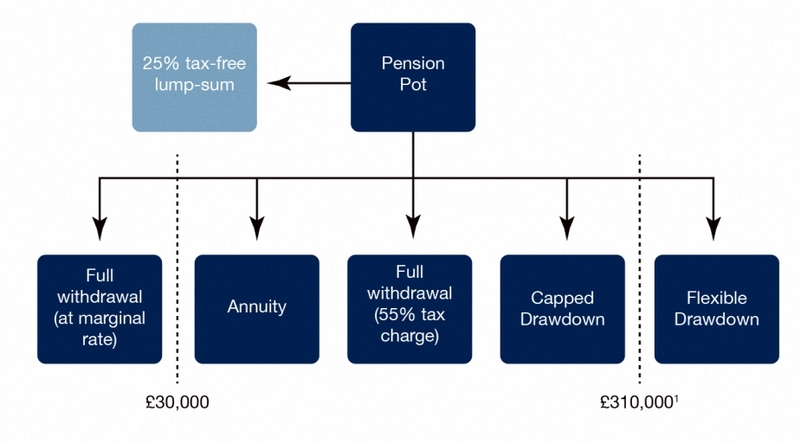 Moving into Pension Drawdown – Happy Birthday to Me! Who’s afraid of sequencing risk?